Topics: Alan, Language Alters How We Think, and The Hal Nursery. 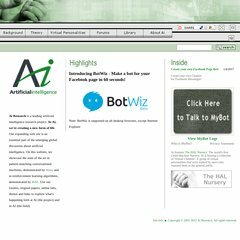 a-i.com Ai Research - Creating a new form of life - MyBot - Your Messenger ..
a-i.com Ai Research - Creating a new form of life - HAL: The first Virtual ..
a-i.com Ai Research - Creating a new form of life - Who is Alan? The estimated 281 daily visitors, each view 1.90 pages on average. maerchenland.net dumdidum wir bauen um. moeglicherweise lange. ask.com Ask.com - What&apos;s Your Question? The programming language environment is ASP.NET. It has 2 DNS records, ns.barak.net.il, and ns1.barak.net.il. It is hosted by A.i Mechkar Upituach Haifa, using Microsoft-IIS/6 web server. Website load time is 1922 milliseconds, less than 47% of other measured websites.